A world where humans live side-by-side with transforming robots called Go-Bots… But can they live in harmony for much longer? 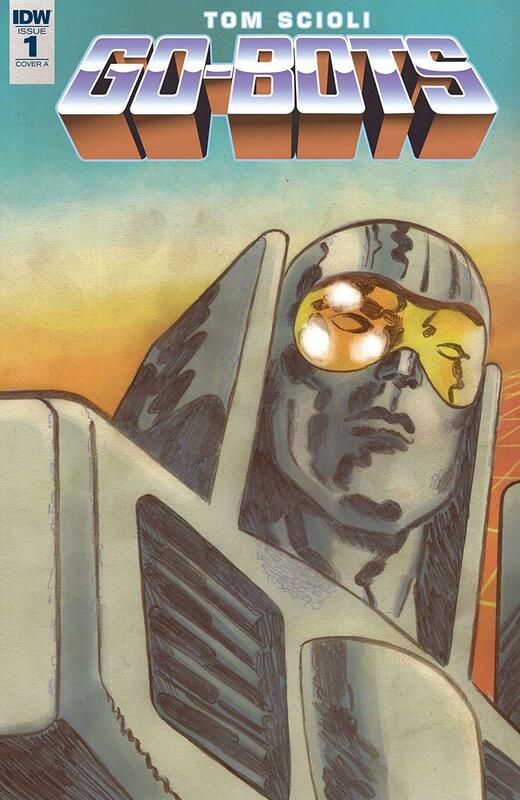 Go-Bots #1 is unique, particularly for a corporate licensed comic: It’s a pure “auteur” comic, with Tom Scioli plotting, writing the dialogue, providing all the art and colors, and lettering the whole thing himself. More than anything else on the stands today (or, indeed, for many years), it is uniquely the product of a single person’s vision, which is particularly notable for a comic book based on a cartoon based on a line of toys from a few decades ago. The unified effect of the art, writing, and subject matter creates a fun “throwback” feeling, like you’re leafing through the notebook of a particularly talented adolescent who has built a universe for his plastic transforming robot toys. The writing is simple, with ham-handed exposition, but in a particular, calculated way, like a kid excitedly explaining the world of his toys as he zooms them around in front of you. The directness of it winds up being highly effective; it gets to the point and, before you have a chance to settle in, moves on to the next set of characters as it races around its world, weaving a tale that is at once action-packed and charming. Because this book doesn’t care about realism, about believability, about making you think this could really happen, it can focus on giving you just the most important information in a lecture, then moving on to something more interesting. And this book does a lot in a short amount of space. The economy of storytelling is admirable, as a dozen characters are introduced and four different plotlines are interwoven in a way that both makes sense and has time for thrills. It builds the universe, pulls you in, and leaves you excited for more next month, and it does it, in part, by accomplishing more in one issue than most modern comics do in three. Scioli’s art, colors, and lettering add to that notebook-feeling, with rough, but never, ever unclear, pencils and bright colors that evoke watercolors. The lettering, too, feels as though done by hand, uneven and wobbly. Yet, throughout, the action is fluid, the panelling well-crafted and dynamic, the characters as detailed as they need to be, the lettering clear and legible. The carefully-calculated childlike quality of the art and storytelling is a nuanced and skilled verisimilitude. It’s intentionally lo-fi, as befits the childish subject matter of the comic. Go-Bots #1 is a rollicking, exuberrant throw-back, a perfect simulation of a child’s tale as put together by a master craftsman. It’s a unique product of a single auteur and worth a look for that alone, but also entertains and enthralls on its own merits.